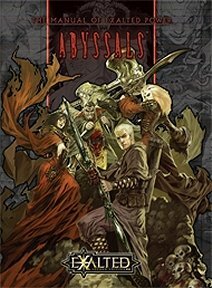 A Guide to the Knights of the Underworld, including details of the Deathlords, their goals and their terrible powers, everything players and Storytellers need to generate Abyssal Exalted characters, including their Charms, and rules for necrotech, an occult science dedicated to building wonders from the corpses of the dead. Publisher's blurb: "Gifted by the Deathlords with the corrupted Essences of Solar Exalts, the Abyssal Exalted are perhaps the greatest extant threat to Creation and its Exalted defenders. Frozen at the brink of death and offered immense power in exchange for servitude to the Neverborn, these so called knights of death ride forth with one shared mission, to drag the world and all that lives into the Void at their masters' behest. Will the Abyssals succeed at their abhorrent task, or will the faint echo of their lost lot as heroes drive them to redeem themselves and, just maybe, rejoin the ranks of the Sun's Chosen?"